The Inflatable Water Park Slide means instant pool fun! Our water park slide comes in two pieces: a shell base and a 5' cube tube. Combine them together and let your kids' imagination run wild. Watch your kids slide into action on the Water Park Slide! 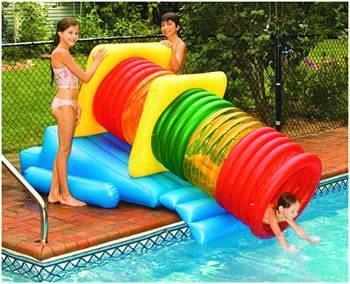 This heavy gauge inflatable will give the kids' hours of fun-filled sliding.